Just two days ago, we received a tip that carrier billing for Verizon customers would go live on Google Play starting today. 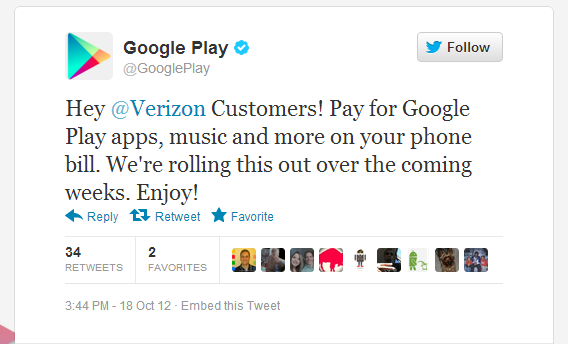 Like clockwork, the following tweet was sent out from Google Play’s Twitter account, confirming our earlier reports. Well, that about sums it up. Carrier billing has finally arrived for us Verizon customers. As a reminder, according to the image we spoke on earlier, there could be a $25 limit set for how much you can charge to your VZW account. Once it starts rolling out to users, we can learn more about it. Let us know when you start seeing the option.